The 2008 and future efforts are directed at this broadened goal with the support and cooperation with five Natural Resources Districts. Actions have been initiated and planned to control all invading vegetation into the stream bed and then by using mechanical operations incorporate and/or dislodge the dead vegetation to get the sandbars to a point that normal scouring actions will again keep the sandbars clean of vegetation requiring a minimum of maintenance by landowners. A priority will also be given to working with landowners in the control of phragmites on upland riparian areas and wetlands to prevent the re-infestation of the river. 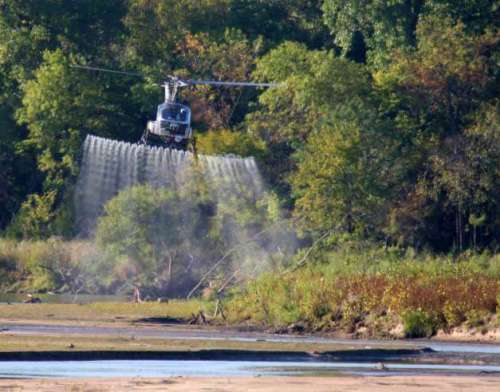 A total of 750 acres of vegetated sandbars were treated by helicopter along 56 miles of the Lower Platte River from the north Douglas County line to the mouth at the Missouri River. An additional 700 acres will be treated along 64 miles of river from Fremont to Columbus. Landowners contributed to the 2008 treatments and will also in 2009. All landowners contacted for the 2009 project have committed to the project. Our website has been developed and maintained to provide information to the general public, landowners and weed management area partners. Priority is being given to providing education, awareness and activity updates directly to the riparian landowners. The newsletters and the guide will soon be available on the website.